A short post, since I’ve let it get so late: The next-to-last place we visited on our five-day Ice Age Floods Greatest Hits Tour was Hole in the Ground Coulee, just south of Cheney, the home of Eastern Washington University. Apparently, the area is called “Hole in the Ground” because of a 100-foot deep hole on the floor of the canyon here (one of Randy’s guidebooks says concerned locals filled it with rocks so no one would fall in). The last stop we made, deep into the dusk, was at the site of a dry cataract not far from the site above, one of the many waterfalls that spilled flood waters south and east toward the Columbia basin when the Lake Missoula ice dams gave way far upstream. Of course, touring the landscape created by the Big, Big Floods of Yesteryear was just part of what’s been happening the last five days. Randy and I were close during our teenage years — my shorthand for him is “my best friend from high school” — and we spent a lot of the time not filled with talk of lava flows, basalt configurations, receding cataracts, loess and loess islands, mesas, spires, potholes, craters, mima mounds, blades, benches, coulees, and the like reminiscing and catching each other up with what’s been happening in our lives. It’s been a great five days. More pictures to come. Columbia River at Wallula Gap, shot from Twin Sisters. Tuesday, Randy and I started out in Kennewick, Washington, made our way to the Columbia River, then south to a landmark called Twin Sisters — a sort of double volcanic spire on the east bank of the river (and in native stories, what’s left of sisters who were thwarted in their salmon fishing then turned to stone by Coyote). Part of the attraction of the Twin Sisters is what you see from there: the Wallula Gap, where the Columbia flows through an opening eroded through the Horse Heaven Hills then enlarged by the Big Floods. From there we made our way over to the Snake River country, the town of Kahlotus and Devil’s Canyon, yet another landscape wrought by the ice age floods. We stopped in the town of Washtucna for a hot dog and a double cappuccino, then headed to Palouse Falls. Palouse Falls is another one of those places that recounts a chapter of the flood epoch. The Palouse River flows through gorges excavated by the ice age floods and falls into a “plunge pool” dug out by the gigantic volume of water that came rushing through 15,000 years ago or so. From the falls, we cruised back through Clarkston, Washington, and Lewiston, Idaho, to Randy’s house in the town of Orofino, population 3,000 and some, seat of Clearwater County. More geoimagery tomorrow. 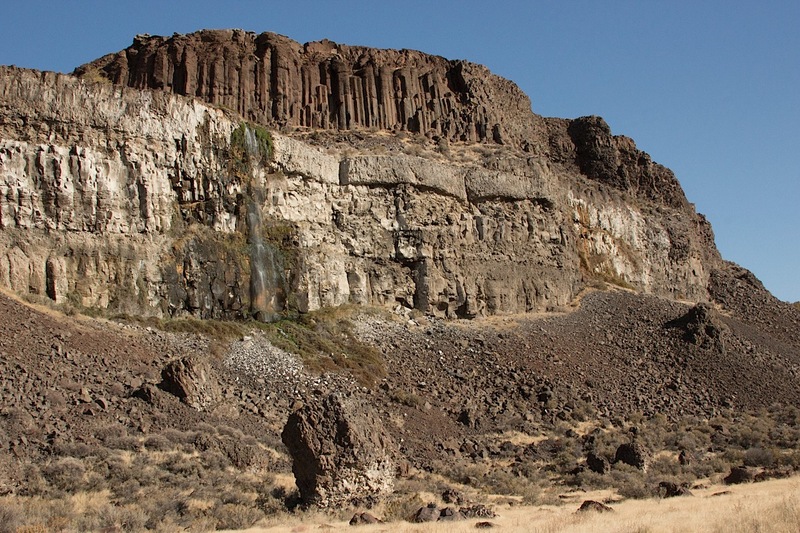 Basalt formations at Potholes Coulee, near Quincy, Washington. Potholes, as in Potholes Coulee, part of the recently mentioned channeled scablands of eastern Washington. This was today’s main event, hiking up the one branch of the coulee — which I’ll describe as a valley about a little more than a mile and a half from west to east, surrounded on both the north and south by 300 foot rock walls. I’ll call it a valley, but it was actually an outlet for the big ice age floods that roared from northwestern Montana into the Columbia River basin. The picture above (click for a larger version) is the north wall of this part of the coulee, which had waterfalls every few hundred yards. The wall consists of multiple layers of basalt from lava flows that occurred over a span of millions of years. That columnar structure high atop the wall (it is actually called a colonnade) and signifies the lower layer of a flow and one that cooled slowly compared to the irregularly fractured section above (called entablature). The lighter rock below is basalt from an earlier flow that spent some time underwater when a lake filled part of this valley. At least that’s what I’ve absorbed over the last few days. And here’s a more scientifically grounded partial explanation, if you’re interested. Me? I’m done. More later. The scablands–that’s what they call big pieces of eastern Washington, where I spent the day with one of my oldest friends, Randy Robinson. Roughly speaking, the scablands are the extensive rocky breaks in the rolling countryside in this part of the state. Mesas, tiered benches of basalt from ancient lava flows, gravel ridges, craters, the random distribution of huge boulders across the landscape. They’ve come to be known as the channeled scablands because of a reinterpretation of the regional geology in the 1920s that proposed that a flood of unimaginable proportions — set loose by the collapse of a colossal ice dam in western Montana, which in turn led to the sudden outflow of a huge mountain lake — scoured and sculpted the land maybe 15,000 years ago. Anyway, that’s a summary of what Randy told me today, and we’ve got two or three or four more days of scabland hiking and sight-seeing ahead. (Where did the term scablands come from? I’m running it down — I find several references in the 1880s that apply that term to this part of Washington; I also found one possible reference from 1630s Britain that may indicate there’s an older and more general meaning of the term. In just 10 hours or so, the A’s and Tigers will be back on the field, this time in Detroit, to continue their playoff series. It hardly seems possible, because Saturday night’s game in Oakland, the game the A’s won 1-0 in the bottom of the ninth, barely seems over. The epic tension of the game, the pitching, the crazy enthusiasm of the crowd (yeah, the Coliseum looks great with those third-deck tarps taken off and all those seats filled with fans), and the A’s finally breaking through to get a run home. Anyway, that’s all I’m going to say on the matter for now. Here’s Kate’s scorecard for Game 2–Tigers up above, A’s below (click the pages for bigger images).